2. for the convenience of some of you who might be in a dilemma like I was! Judging from my title, it shouldn’t be hard to guess that I’ve recently started on my Invisalign teeth straightening journey! To be completely honest, my teeth has always been one of the BIGGEST insecurities of mine because they’re really, really crooked. As a kid, I used to smile a lot with my teeth but as my milk teeth fell and adult teeth grew one by one, I started realising that I… didn’t like my smile anymore. I mean, with teeth like that, who would be confident in their smile? I definitely wasn’t. Even though some friends of mine would tell me “it’s not that bad!” I just wasn’t confident enough to smile with teeth and gradually, I realised that I never smiled with teeth anymore — especially not in photos. For the longest time, I’ve considered metal braces due to its affordability, but after hearing about how some of my friends had difficulty eating with braces on and dealing with issues such as being cut by the sharp metallic wires, along with difficulty in brushing and flossing their teeth, hindrance in speech, etc, I grew quite apprehensive about it. Moreover, as I got older, I was also put off by the idea of having to smile with silver wires showing. Doing what I do meant having to be in front of the camera pretty often and having metal braces on would’ve just been inconvenient, and frankly, not aesthetic. Of course, to better weigh my options, I read up on articles online and found some of them to be really helpful! You can read about the different orthodontic treatments and compare them via this article HERE. Braces wearers are required to do monthly reviews with their dentists, whereas for Invisalign, you only need to make a trip to the clinic every 6 to 8 weeks. Time is money, right? As the name suggests, Invisalign is a form of clear aligners which comes as a popular alternative to traditional braces for the simple fact that they’re more convenient and comfortable to wear throughout the day. I’ve done my own research and found there are several types of Invisalign treatments, but of which, the most popular, which you may have heard about yourself, are the Invisalign Lite and Invisalign Full! For my case, I was provided with two different treatment options. After detailed discussion regarding pros, cons, and cost of each option, I decided to proceed with Invisalign Lite to correct mainly the alignment of my upper set of teeth as well as minor misalignments for my lower set. This meant that instead the typical 2 to 2.5 years for Invisalign Full, I would only require 1 to 1.5 years for Invisalign Lite! You can also read more about the different types of Invisalign treatments available HERE to find out which suits you better! And if you didn’t already know… I’m currently undergoing an Invisalign treatment plan with i.Dental Capital Tower. 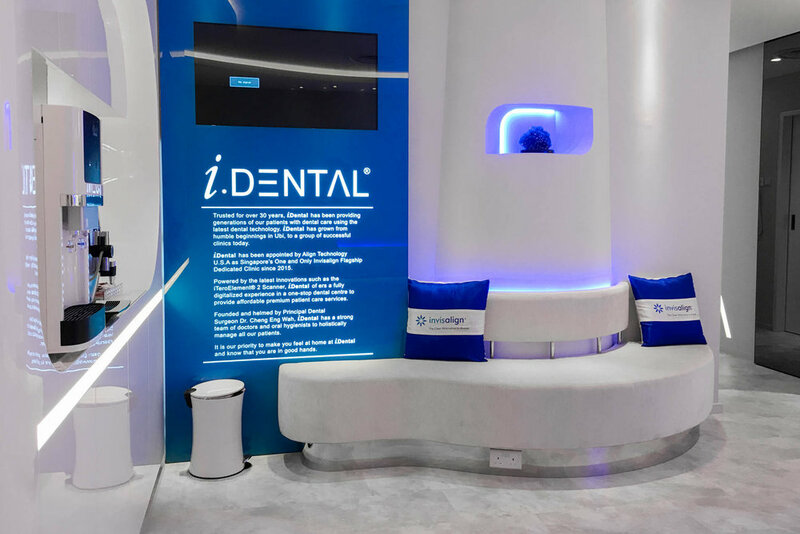 As the appointed flagship clinic for Invisalign in Southeast Asia, iDental was definitely one of my top choices when it came to getting Invisalign done. 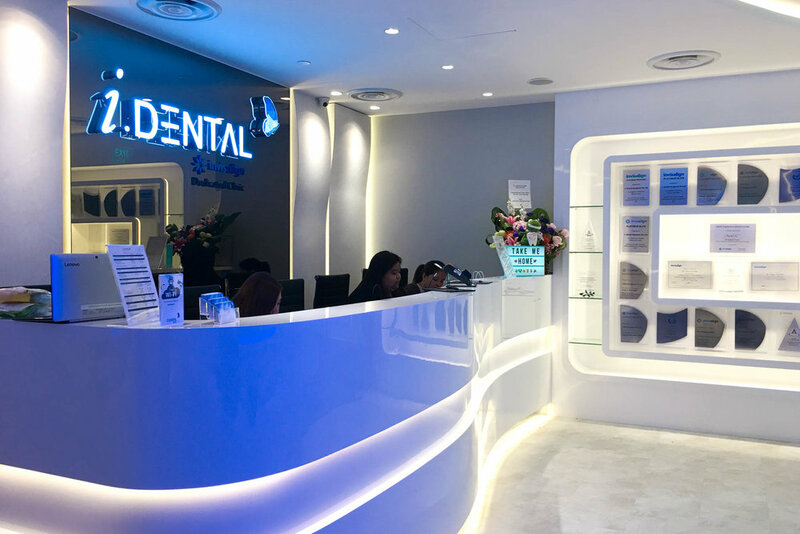 Not only were they the first and only ‘Invisalign Black Diamond Provider’ in Singapore — something they’ve achieved by maintaining their position as the clinic with the most number of cases treated — but that meant they definitely had experience on their side too. You can see why I feel assured in leaving my teeth-straightening woes in their hands, am I right? Furthermore, i.Dental Capital Tower has night and weekend appointments available, which works well with my hectic schedule! 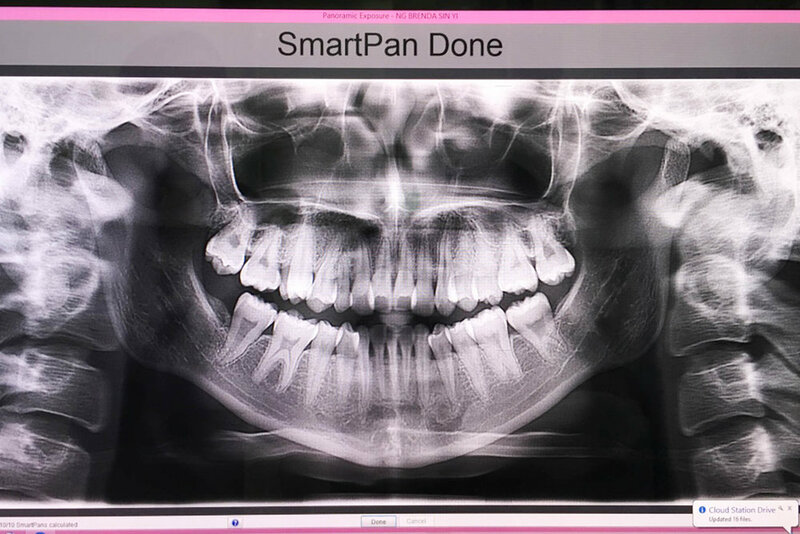 I popped by iDental a couple of times for consultations with Dr Park where I got my teeth digitally scanned and visualised through a 3D imaging device, called the iTero! 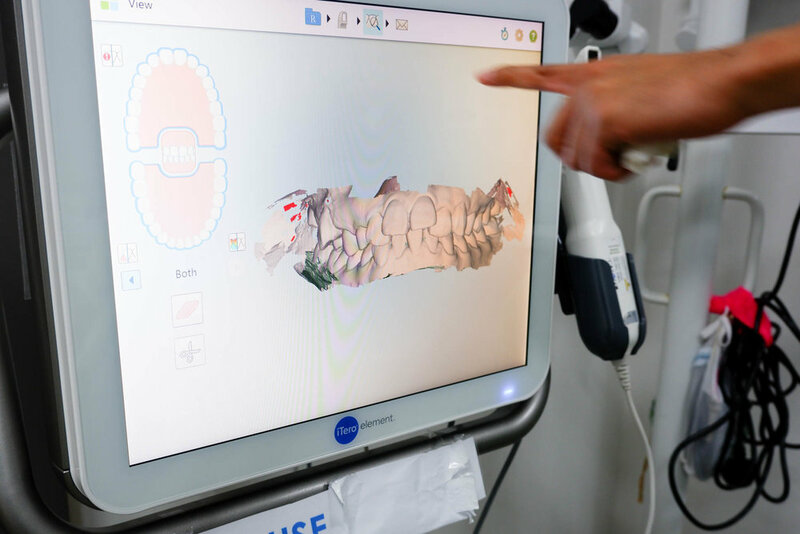 Instead of getting traditional dental impressions done using moulds (which I believe can be rather uncomfortable...), the iTero intraoral scanner gives a 3D image of my teeth within minutes, and was also even able to simulate the approximated end outcome of my teeth! I was actually really nervous the night before the extraction but thankfully, the whole procedure with Dr. Park went like a breeze, I knew for sure, I was in really good hands. I also had my teeth scaled and polished to ensure they were nice and clean before donning my aligners! Remember, it’s recommended to get your teeth scaled and polished every 6 months to ensure they’re clean and healthy! GETTING MY FIRST SET OF ALIGNERS! Before receiving my aligners, I had to get a number of attachments placed on my teeth. They are little tooth-colored bumps that were secured to my teeth to help give the aligners a better hold, and direct the bite to a better position. They’re practically invisible and you wouldn’t even notice unless you look REALLY up close. And with that, I was ready to start wearing my aligners! I couldn’t be happier when I received my first set of aligners because it meant I was one step closer to the straight teeth I always wished for. Just wearing the aligners gives me that little bit more confidence to take more selfies. While a wide smile is not quite on the plate just yet, I definitely feel like I’m working my way towards that point! Can you even tell I’ve got aligners on at the moment? But it’s super easy to snap them on and off, which is one of the biggest reason why I love Invisalign! With the end goal in mind, I’ve been very diligent in wearing my aligners. And with the help of the experienced doctors and staff at iDental, I’m really looking forward in attaining a confident, beautiful smile in the near future! Speaking of which, I’ve also been getting quite a number of questions from friends and followers regarding my Invisalign treatment, so I hope this blog post gave you a better idea of my journey to straight teeth. Feel free to shoot me more enquiries and I may answer them in the near future! Admission is $21.40 (with GST), inclusive of consultation, smile assessment and goodie bag. 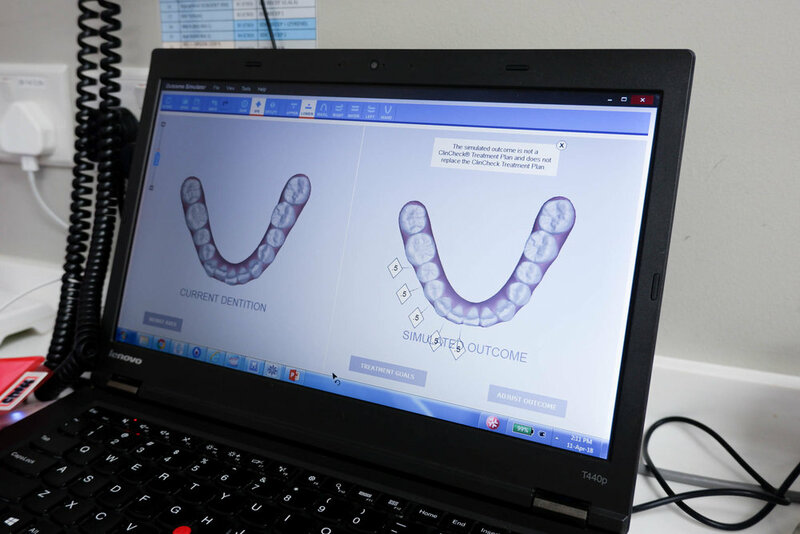 Attendees will get to see how their teeth will look like with the latest 3D simulation software iTero Element 2. Attendees will also enjoy exclusive treatment package price and receive a free set of clear retainer worth $450, if they sign up on the same day. Hello! Here's my second post of 2018 - dedicated to my favourites of the month! January flew by so quickly and in the blink of an eye, we're off to the second month of 2018. Crazy, am I right? I received this in the mail early this month and it's been one of my favourite masks to use! It may seem gimmicky, but this mask is not only fun to use but works great on my skin! It's supposed to help to minimise the appearance of pores as well as to moisturise your skin - and my skin does feel more supple after each use. The texture does remind me of white PVA glue, except it smells pretty nice, and I like that it can be peeled off in one piece when dried completely. Oh, and do ensure you apply a thin layer as it helps you to peel it better! I've been loving the Moist Diane Extra Fresh range for the past couple of months, and I love that it leaves my scalp feeling fresh and minty with the 'cooling effect'! My mum doesn't really like the scent, but I personally fine that the scent is great. Well, for someone who doesn't wash her hair every day, the scalp essence works to soothe my scalp and freshen up my hair on days I'm not shampooing and I love that it leaves my hair smelling fresh. Got this as a Christmas gift and I've been loving this scent a lot! The scent is really light so it's perfect for someone like me who's very sensitive to fragrances. 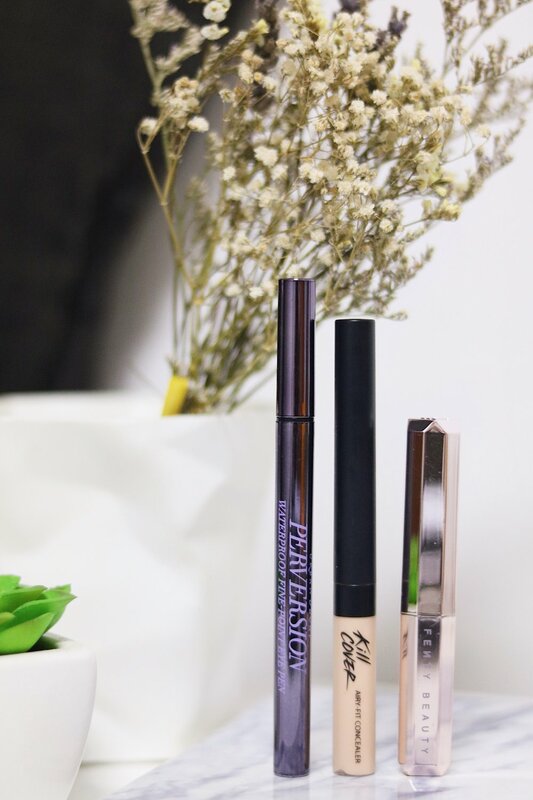 Hands down one of my favourite brow products yet! We don't often see eyebrow cushions, do we? I love that this comes in two different shades, which makes it easy for me to achieve the ombre brows look. With the brush that comes with the eyebrow cushion, it's also really easy for me to pick up the product and fill in brows - for defined brows that last me through the day. It's been really humid recently so I opt for products that I know would stay on throughout the day. 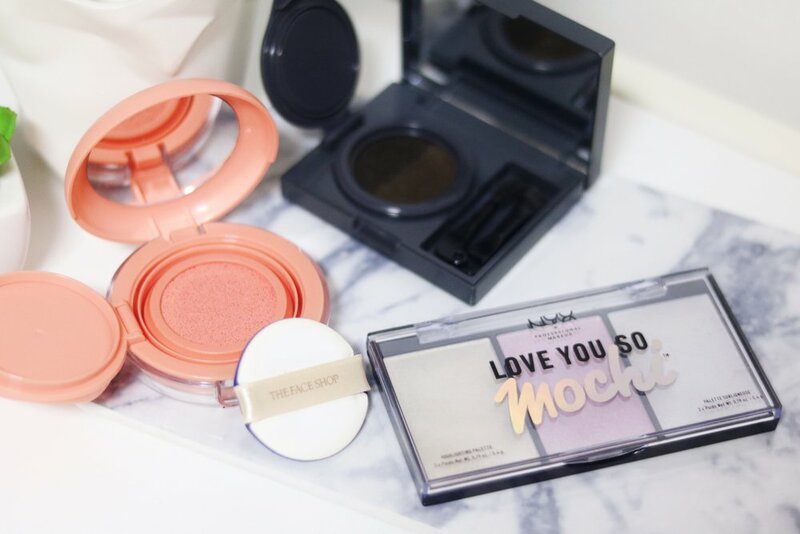 This blush has been my favourite as it leaves my cheeks looking hydrated and glowy (think Korean glowy skin). Despite being a cushion blush, it lasts me throughout the entire day even in the humid weather! Despite having owned it for a couple of days, this is fast becoming my favourite highlighting palette already! For its friendly price tag, this highlighter is HIGHLY pigmented - comparable to many popular (and expensive) highlighters in the market, and I love that it's 3-shades-in-1 so I can match it according to my eye and lip make up. It's launching in February and this entire collection is definitely gonna be their star this season! I've tried numerous waterproof eyeliner pens and while brands like Kat Von D are amazing, I find that KVD's eyeliner gets used up really quickly... Either that or it dries up way too fast! I've used this UD eyeliner for a couple of months now and it's still very inky, pigmented and extremely smudge proof. Only downside is that it can be a little expensive, but for what it's worth - I'd definitely pay for this. This just appeared at my doorstep like, 4 days ago? I know right! But anyway, first impression before trying it out: "tiny concealer, probably would not offer enough coverage". This concealer however, took me by surprise! The coverage is really great and it's very easy to blend as well. Instead of blending 2-3 different concealers together for better coverage, I have been using only this for the last couple of days. It stays on throughout the day without any cracks or lines, and I absolutely love this concealer! The only downside is the size, as it's relatively small compared to other liquid concealers I own. However, I do think the size isn't so bad after all as it fits well in my tiny bags! I bought one of these lippies when it first launched because it was so highly raved by beauty bloggers and youtubers alike. This made it to my favourites list because the colour (Spanked) is absolutely gorgeous and true to pictures, and I love that it feels really lightweight on the lips. Most matte lipsticks I've tried can feel really heavy and drying on the lips, but this one doesn't. For $28, I thought it was a little smaller than expected, but that's fine too cos I like smaller-sized products that fit in my bag easily! 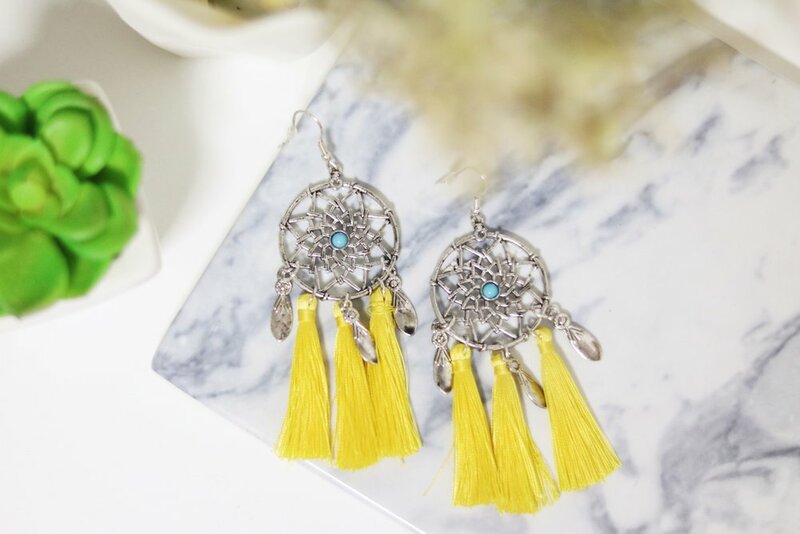 I just HAD to include this pair of earrings in my January Favourites because I really LOVE IT. Especially because it's in yellow (I have a weird obsession with yellow recently) and so cheap! We all know Lovisa's accessories can be a little expensive sometimes so when I read that they had a sale, I knew I had to check it out. And yup, I scored a pair of these for 4 bucks at their '3-for-$12' section! The usual price is $20, but I got mine at 80% off. Score! Well that concludes the end of my January Favourites! Hope all's gonna go well for February! I can't wait because Feb also marks my anniversary with Javis, Valentines' Day as well as Chinese New Year. Bring on the festivities! NOTE: Some of these products listed were sent to me to try but all opinions are my own. Hopping on the bandwagon of metallic lip colours with the brand new Velvet Matte Metallic lippies from Palladio! 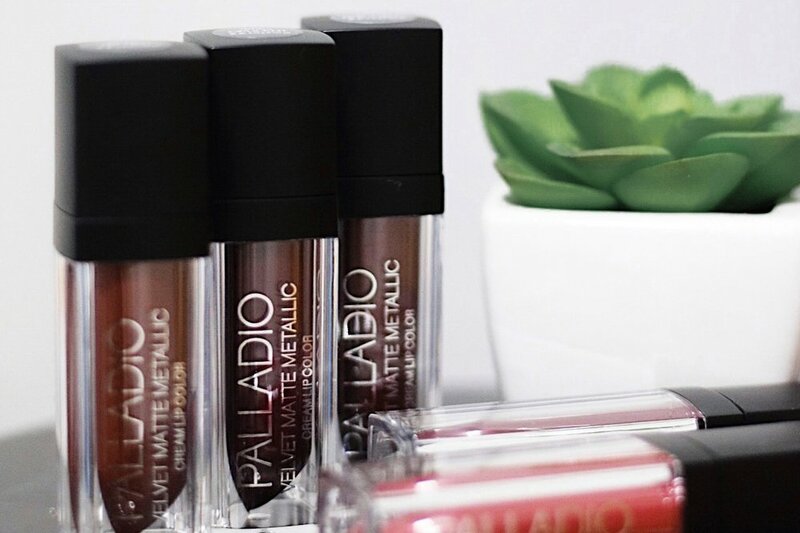 No stranger Singapore's large selection of drugstore beauty products, Palladio hit the market last year and has since been a popular option not only because of the friendly price tag but because their botanical products are infused with vitamins. I've had friends recommending me some of their lip products but never got to try them until recently! I haven't had a chance to try out all the colours but I must say they are actually pretty darn pigmented. 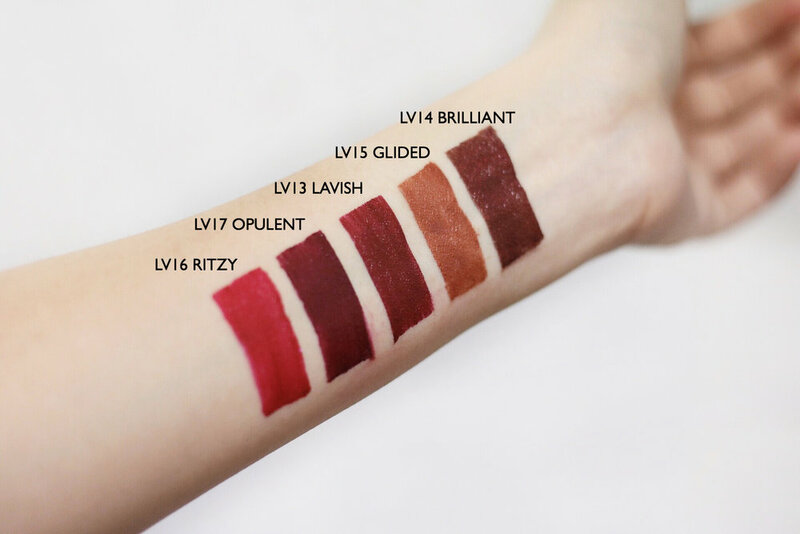 I like Glided for its unique orange-bronze hues but my favourite of the lot has to be Lavish - a deep berry red with slight blue undertones. Personally, I think the metallic sheen is pretty subtle - which might be a hit or miss depending on which end of the spectrum you're on. If you're looking for loud and funky metallic lip colours, this wouldn't be a good option. These lipsticks definitely don't have long lasting power and are not transfer-proof. After all, when it comes to liquid lip colours, I don't have high expectations of the lasting power. However, it took me quite a while to remove these swatches from my arm and I still have some stains that couldn't be removed, so I guess it doesn't fare that badly! - Very affordable at only SGD $11.90 a pop! Palladio will be having an event on the 26th and 27th May at ION Orchard's Guardian from 6pm to 8pm where they will be giving out 100 pieces of the Velvet Matte Metallic Crème Lip Colour each day! To redeem your free lipstick, simply leave a comment on Palladio's Facebook page's event post stating your favourite #velvetmattemetallic colour! I've been traveling rather frequently this year and in my recent trip to Bangkok, I'm glad to have some of these holy-grail products to keep my skin healthy and well-protected from the harsh sun rays.